Jill Kintner has been America’s top female gravity racer for so long that it’s hard to remember a time when she didn’t have that distinction. Jill is our top downhill racer, our top dual-slalom racer, our top pump-track racer and sometimes (as in 2015) our top enduro racer. 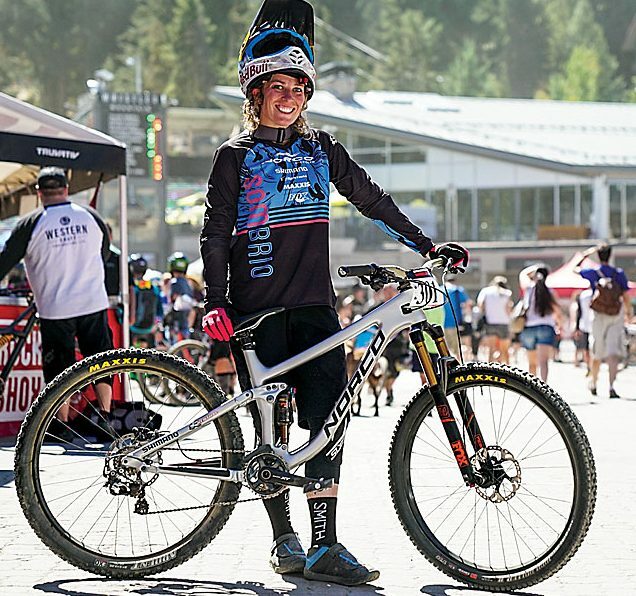 We met up with her at Whistler this summer, where Jill won the Queen of Crankworx title for the third time in a row. We primed her with tons of questions and got her to tell us all about herself, her bike and her life. Read on. Jill: Mom worked for United; Dad was a tile and marble contractor. Jill: Supposedly 2 years old. MBA: What kind of biking did you do before mountain biking? Jill: I grew up racing BMX at our local track, North Sea Tac BMX. I did well enough to take it to an Olympic medal. Jill: In 1999 I had a beater Rocky Mountain XC hardtail. My first real mountain bike was an Intense Tazer 4x bike. Jill: In 1999, I raced that XC bike at Sea Otter. In 2002, I raced Pro 4x and slalom. Jill: In BMX I did. MTB, I won Sea Otter slalom but couldn’t shift or keep my chain on. Jill: World titles, an Olympic medal and 17 national championships across five disciplines. Jill: I did. I went to school for graphic design in Rochester, New York, and San Francisco. Jill: High school honor roll, MVP on varsity soccer and #1 singles in varsity tennis. Jill: Soccer for most of my youth, tennis, racquetball, snowboarding, [motocross], minimal climbing and lots of hiking. Jill: My brother was a professional BMX dirt jumper in the X Games long ago. My dad did downhill skiing for the University of Washington. My mom likes African drumming. My husband, Bryn Atkinson, is a professional downhill mountain biker from Australia. Jill: I’m left-handed. I’ve been on “The Oprah Winfrey Show.” I drive a sprinter van. 1. Frame: Norco Optic 27.5 Carbon, size small, 120mm. 2. Fork: Fox 34 Float, 130mm, sag set at 10–20-percent travel, rebound set fairly quick. “It’s set up like a trailbike but firmer to keep it snappy and take the edge off. 3. Tires: Maxxis: 27.5×2.3″ High Roller 2 (front); Maxxis Ardent 27.5×2.25” (rear); pressure set at 26 psi in front; 30 psi in rear (for rolling speed). 4. Tubes or tubeless: Stan’s tubeless system. 8. Rear hub: Stan’s Boost hub. 9. Brakes: Shimano XT, 180mm, Centerlock rotors. 10. Handlebar: “Renthal Fatbar Lite, carbon, 30mm rise. “Renthals are the best bars. The Fatbar Lite comes stock at 740 millimeters, which is what I run. 11. Bottom bracket: Shimano XT. 12. Grips: Renthal lock-on, traction ultra-tacky. 13. Cranks: Shimano XT, 170mm. 14. Chainring: Shimano XT, 34-tooth. 19. Brake levers: Shimano XT. 20. Rear cassette: Shimano Ultegra 10-speed. 21. Saddle: Fabric Line saddle with chromo rails. 22. Seatpost: Thomson, cut short. 23. Cables and housings: Shimano. 24. Headset: Cane Creek 110 series. 25. Shock: Fox Float EVOL. 26. Stem: Renthal Duo, 50mm. 28. Extras: E*thirteen TRS chainguide.